Steven (Chicagoland, United States) on 19 December 2012 in Landscape & Rural and Portfolio. Pigeon Point Lighthouse is a lighthouse built in 1871 to guide ships on the Pacific coast of California. It is the tallest lighthouse (tied with Point Arena Light) on the West Coast of the United States. It is still an active Coast Guard aid to navigation. Pigeon Point Light Station is located on the coastal highway (State Route 1), 5 miles south of Pescadero, California, between Santa Cruz and San Francisco. The 115-foot white masonry tower resembles the typical New England structure. Because of its location and ready access from the main highway, Pigeon Point entertains a large number of public visitors. The lighthouse and the land around have been preserved as Pigeon Point Light Station State Historic Park, a California state park. The lighthouse is also designated as a California Historical Landmark. 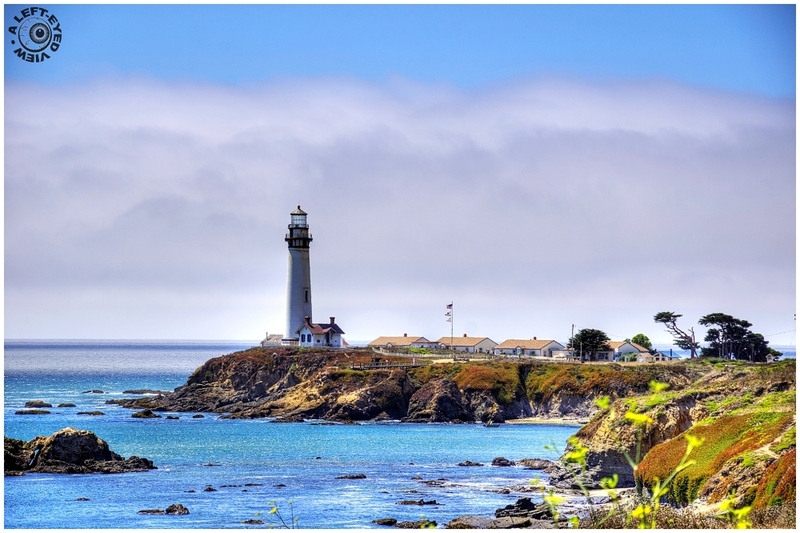 Pigeon Point Lighthouse is one of the most picturesque lighthouses on the Pacific coast. The tower stands on a rocky promontory and has long been a landmark for ships approaching San Francisco Bay from the south. This headland, and hence the lighthouse, took its name from the ship Carrier Pigeon that wrecked here in 1853. The lantern room of the tower is no longer equipped with the original first-order, 1000-watt Fresnel lens. No longer illuminated for demonstration purposes, the lens has 24 flash panels, is composed of 1008 hand-polished lenses and prisms and is capable of producing over 500,000 candlepower illumination. It was manufactured by the Henry-LePaute company in Paris, France and was first lit at Pigeon Point at sunset on November 15, 1872. Wunderbare Aufnahme und eine gute Information. Beautiful scene. Have a nice day. Gorgeous scene and lighthouse - the colors are fantastic, and the I just love those low clouds. Nice shooting, Steven! Lovely tones and colors. My inclination would have been to compose to leave out some of the low, more modern looking buildings to the right, but I admire your framing because it includes the billowing flags and those wind-sculpted trees at the very right edge. This series of yours has probably moved the Cailfornia coast up a notch or two in my list of "places I gotta get to." A gorgeous image with so beautiful colors and splendid framing. Des couleurs resplendissantes ! Merci pour toutes les explications. Great colors and nice vista ! even though they may no longer serve their original purpose, i'm glad they're kept as monuments as they do look stately and elegant and add great charm to any coast !!! Absolutely beautiful! Wonderful color and I like the clouds! A classic picturesque lighthouse setting, beautifully captured ! Wonderful nautical scene; a very beautiful postcard! fantastic composition with the lighthouse being appropriately prominent in the frame! wonderful colour tones! I've been to Pt. Arena, and Cabrillo Pt. Lighthouse, but not this one. Where is this? Lovely shot.